A Skitzo Calypso concert was my first exploration into the world of Brad Cox, and what an introduction it was! Immediately after discovering the band, I found their website and downloaded several free songs, many of which would later appear on Ghosts II: The Beyond. But not long after that, they went on an indefinite hiatus. Vocalist, Cox, and drummer, Gary Holmes, turned their efforts towards Skitzo’s sister band, We Love The Underground, which I quickly grew to love. But now, as the latter group has decided to take a sabbatical, the former group has re-emerged with a series of teased songs and a forthcoming EP entitled A.L.I.C.E. I was lucky enough to get my ears on the new tunes in all their glory. The first song, “Reaching For An Emerald Sky,” wastes no time, bum rushing the listener with cascading key strikes from producer Tony Correlli. Guitar chords chisel out a path alongside the vocal melody, leading us up and up towards a chorus that, by the end of the song, begs to be heard again. 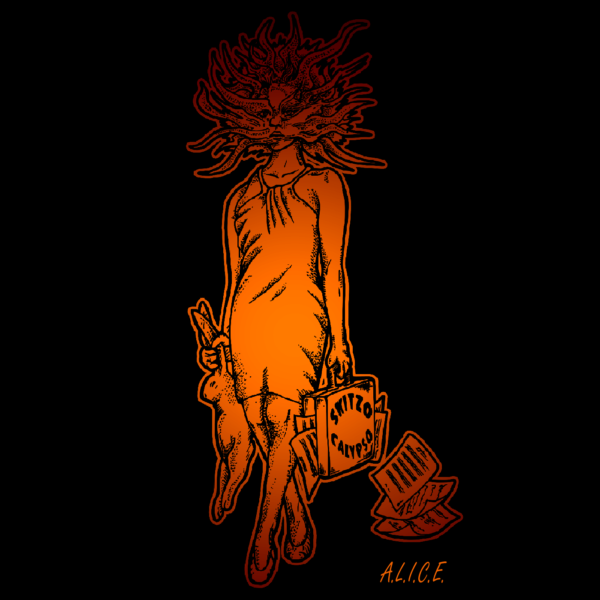 Though the EP is named after the heroine from Alice’s Adventures In Wonderland (or Through The Looking-Glass, if you prefer), the inspiration for this song bears quite a different name, and the lyrical content here plays off her story beautifully. Next is “She’s Not Coming Home,” with twinkling guitar notes draping vocals that trudge forward. The rhythm section almost provides a move-a-lator of sound from which Brad’s words push forth. This song marks a darker turn for the record, but features one heck of a stunning solo! “The Broken Part Of You” is the central slice to this work, and I freakin’ love its bass-intensive intro. Cox explores multiple vocal approaches here, providing a varied listening experience. The dark clouds from the last song are still surrounding us, but we’re not going down without a fight. “Now you’re broken too” he screams into the night. “Eulogy Of Me” is a lengthy atmospheric piano piece, courtesy of Calypso-alum Cherry Teresa, where the vocals sits close to your ear. It’s finally here where the skies begin to clear and hope emerges, showing us a bright future awaits. Cellos and violin additions add strikingly to the dichotomy of light and dark, and a guitar solo emerges out of a scene occupied sparsely by piano notes, captivating us and leading us back to meet the rest of the band. The final piece of the puzzle is “The Tortured And The Hare,” which features former bassist, Zeke Johnson, launching full blast from the onset. Though not necessarily a fast song, it is unrelenting, tugging the listener along for the ride. The killswitch on Brad’s voice adds intensity to the song. Here’s where we give way to the Wonderland analogies, with white rabbits aplenty. We chase them from one landscape to another, perhaps an homage to its inspiration, but they never go too fast to lose us, continually putting us through our paces. There’s no place like home, and that’s where we find Skitzo Calypso: at home in their element. This little EP is filled with big hooks, but the meat is in verses. Cox fully commits himself to each moment and there’s never a doubt that every word sung is important. The dual guitar attack of Bryan Holmes and Patrick Sise is beautifully choreographed and it’s great to hear the Holmes brothers together once again. A.L.I.C.E. allows us to share in this foursome’s rock n’ roll insanity only briefly, but it’s an adventure that you’ll be happy to repeat.